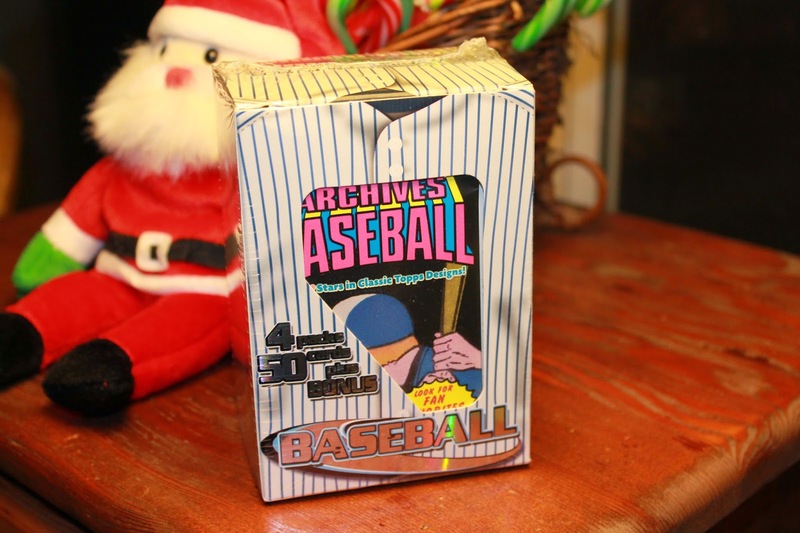 Inside a big box of baseball cards one is bound to find a lot of variety, even when the topic is only Angels. 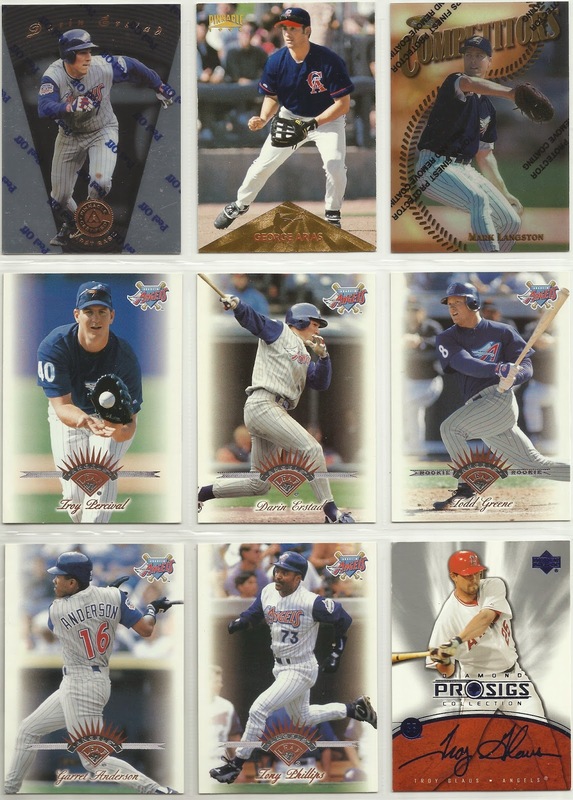 There were a lot of cards in that box from Infield Fly Rule as you can see, but I just picked out some to demonstrate the wide variety of styles as well as personal collection hits that there were. 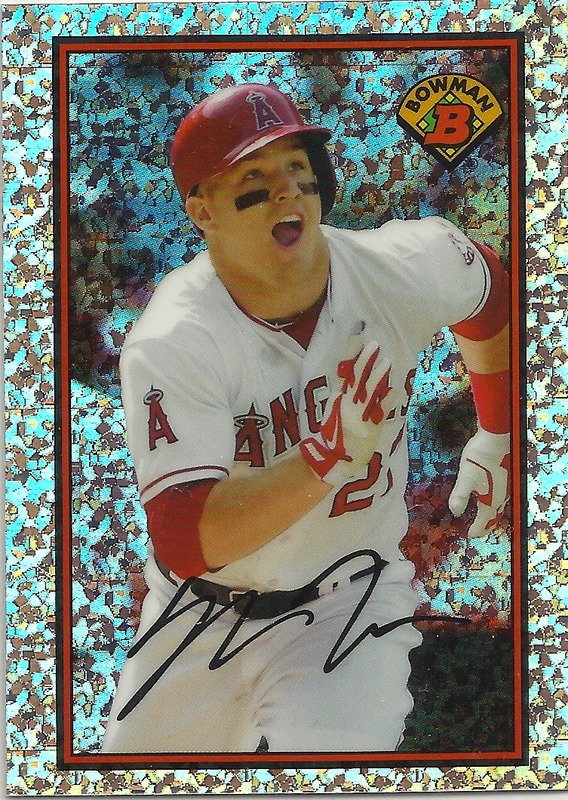 Mike Trout Collection, Chrome, Portrait. The one on the right is also a Variation (note the white circle under the TM). 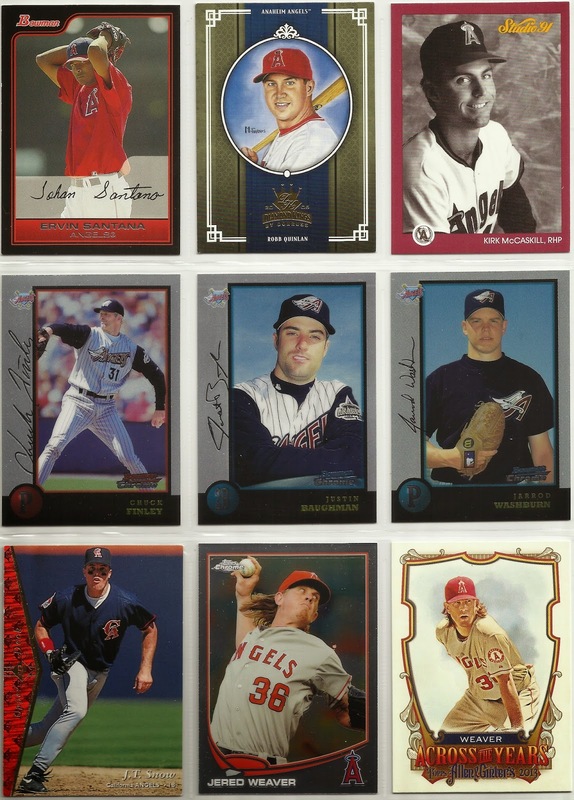 Nolan Ryan Collection, Wally Joyner Collection, Former Angels, 2-Player Card. 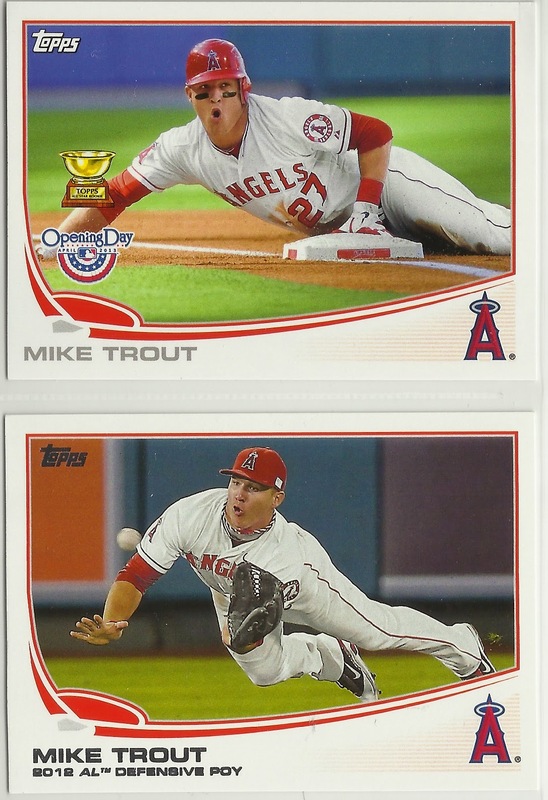 Former Angels, 2009 Upper Deck Set Collection (along with a short stack of other 2009 Upper Decks I needed). I really enjoyed going through this box. The sorting of it will probably take days. 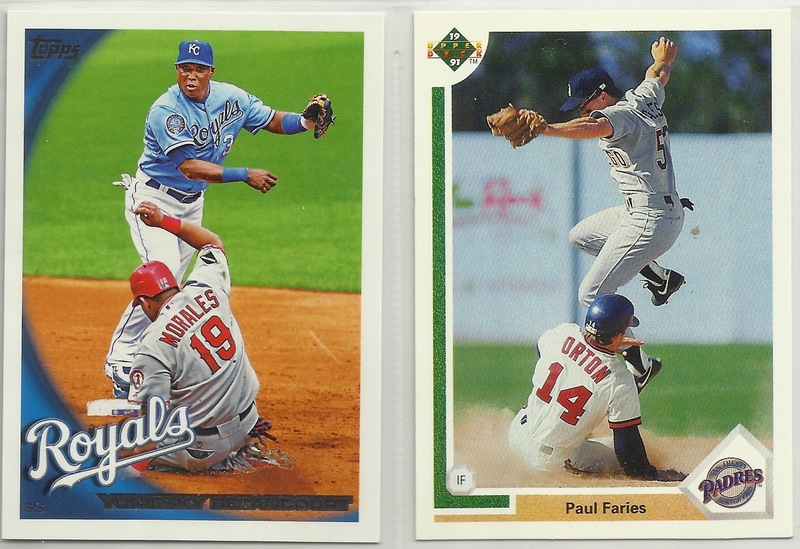 3 more of those nasty (meaning hard to find) X-cut cards from 2008 Upper Deck X. Very glad to get these. Now I only need cards 14, 30, and 86. 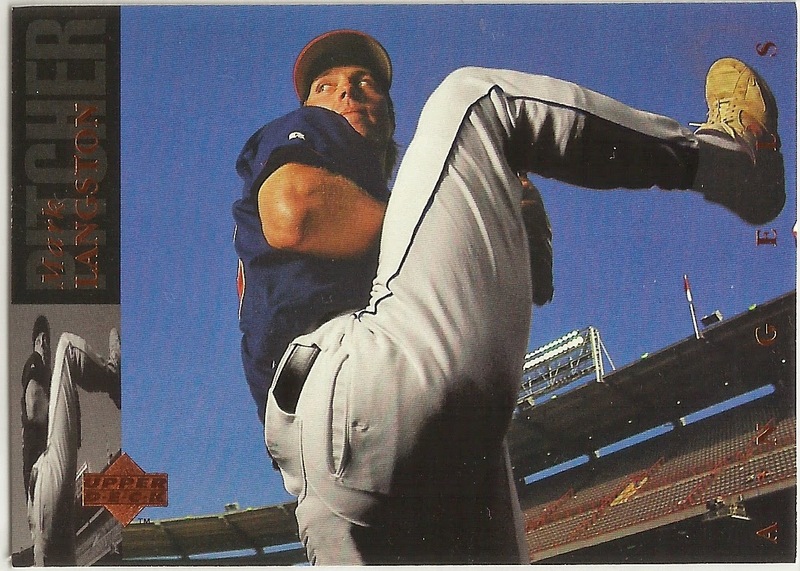 And another nasty one from the massive 2008 Xponential insert series. Only 62 more to go! 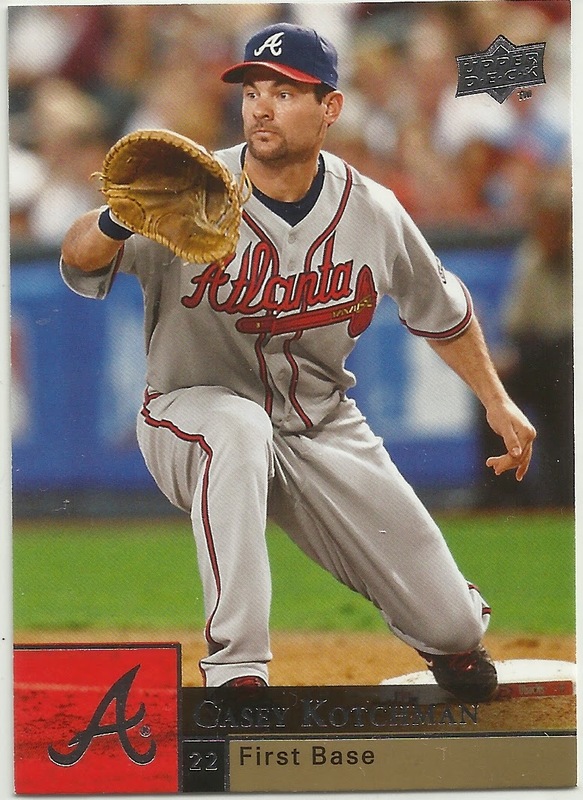 And there was more help with the 2009 Upper Deck set, this card representing the short stack that was sent. I'm within about 50 cards of this behemoth 1,006 card set. 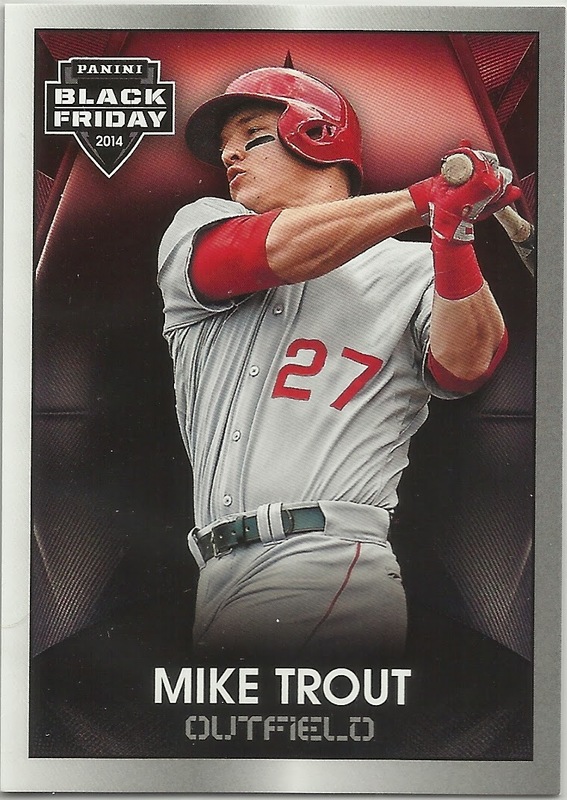 Within 50 cards of the base set. 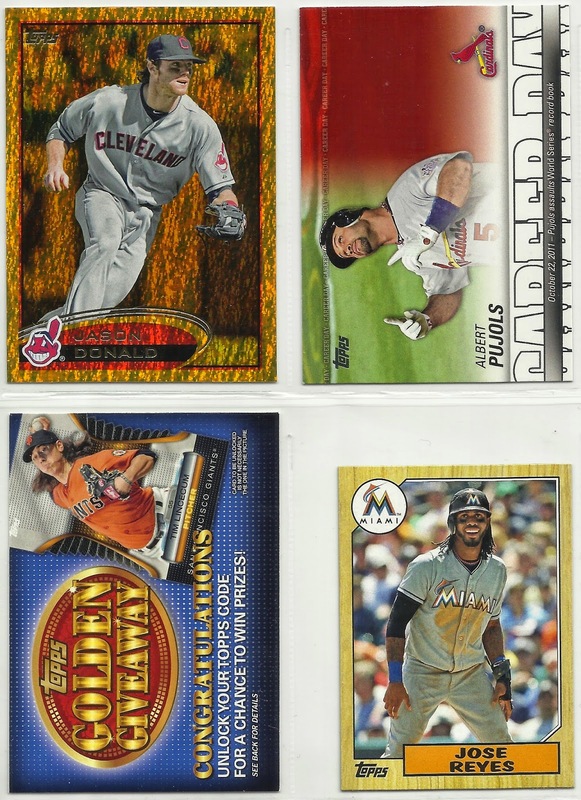 I'm also doing several of the insert sets. All this help is much appreciated. Hey Night Owl, Look What I Just Earned! Found it next to my stocking on Christmas Morning. Santa is sweet that way. Four packs of cards, a box of 50 random cards, and a BONUS! Fairfield repacks are typically not my style, but they are fun to open on Christmas morning. 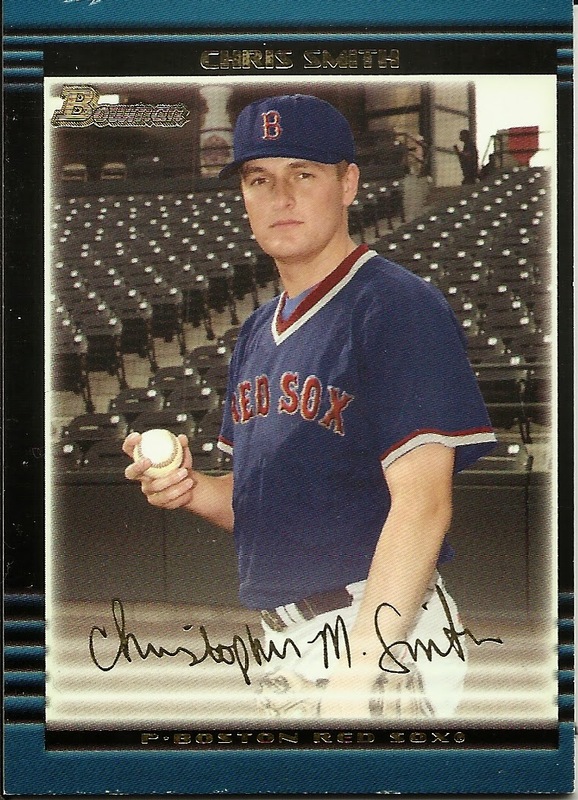 2003 Bowman Gold Signature of someone named Chris Smith. 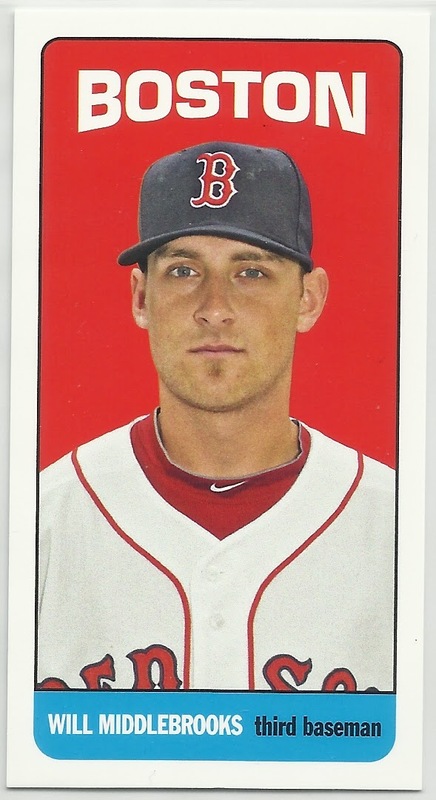 At first I thought I had poorly cropped the scan, but no, the card itself is miscut. Then came the box of 50 random cards. Here are the highlights, and there aren't many. 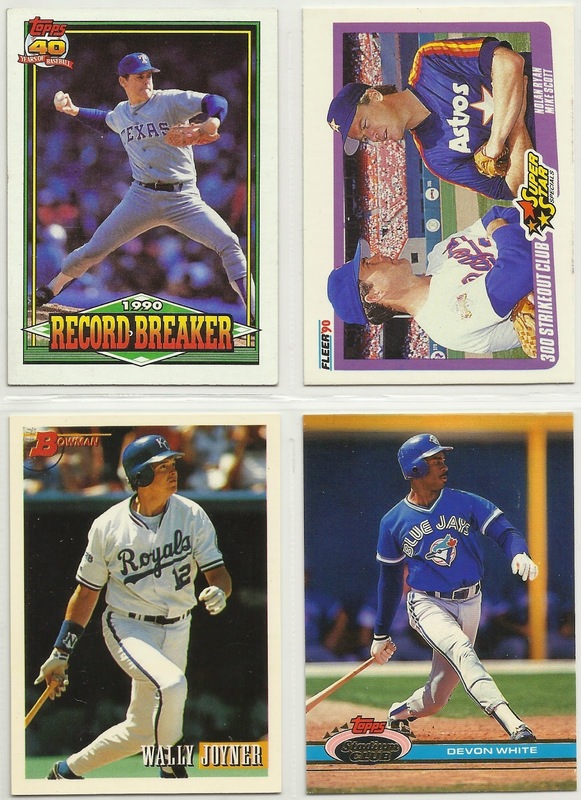 The Sandy Alomar Topps 1990 Rookies fits a collection of mine. 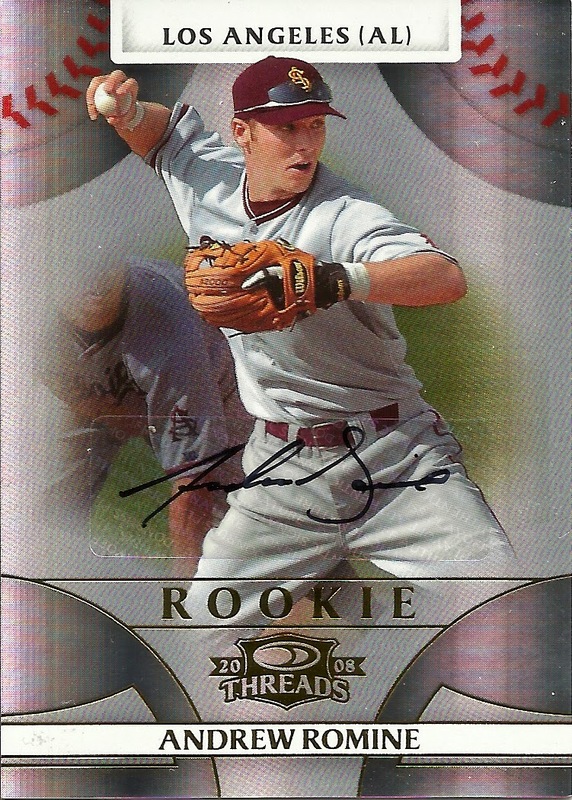 Hunter Pence' rookie card is neat, but only because it's relevant right now. The Babe Ruth Color Conlon Collection is a prototype card, so that's really cool actually. 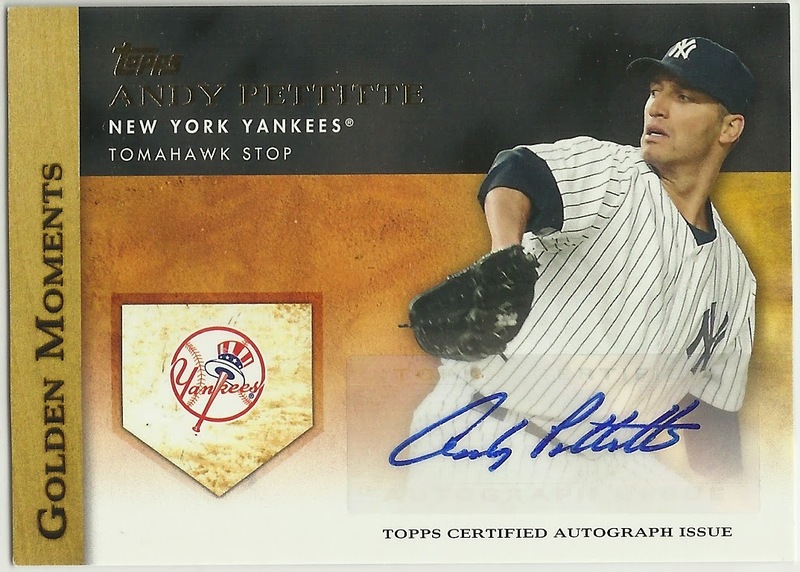 Uncommon Jeter, nice but he'll end up on Listia. 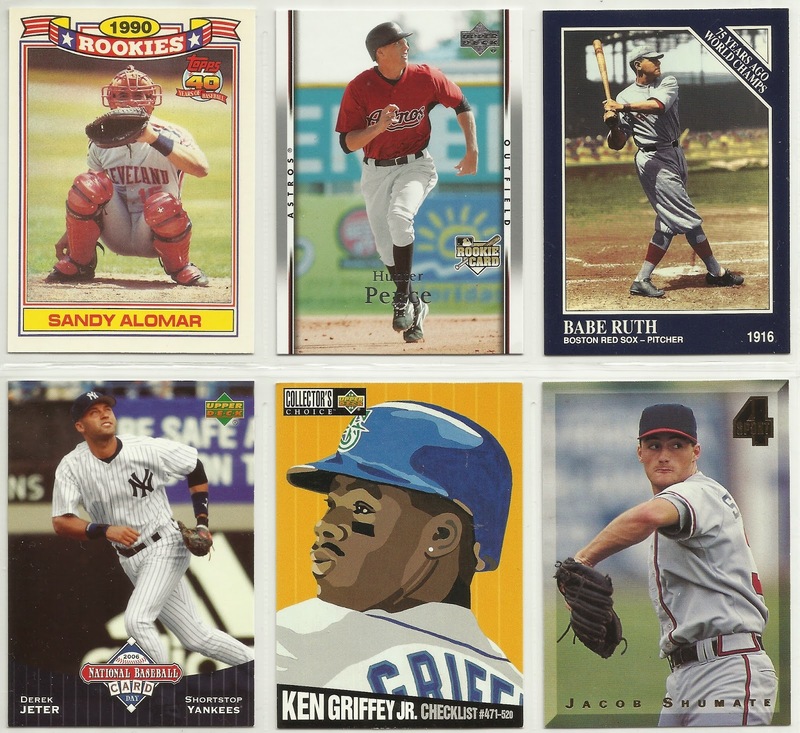 The Griffey fits into my new checklist collection (more on that later). 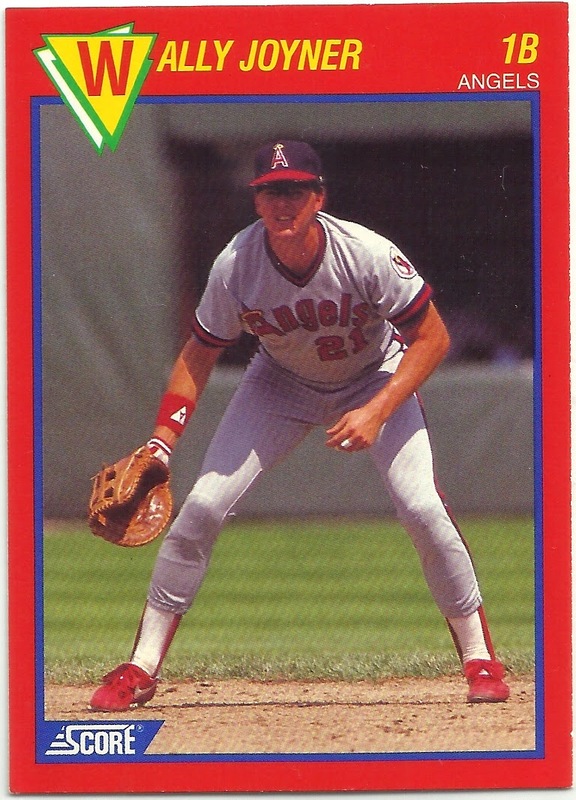 And the Classic 4-Sport is just a just a sweet looking card. One decent hit, a tall boy. 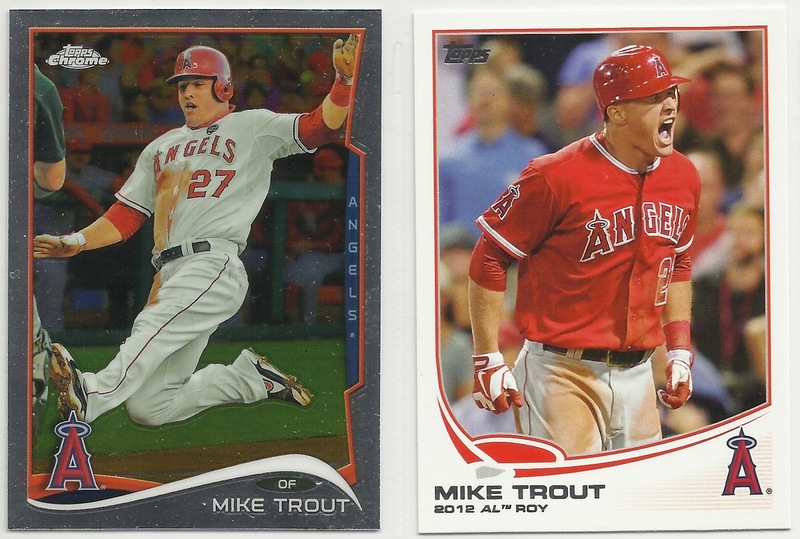 Cool right off the bat because the wrapper features Mike Trout and I needed it for the Mike Trout Wrapper Collection. 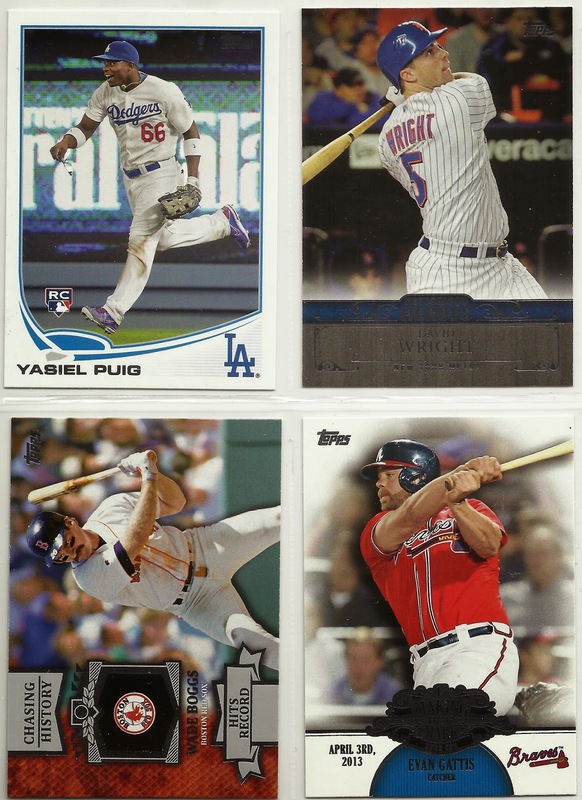 The Puig Rookie is nice, if that's even his true rookie. 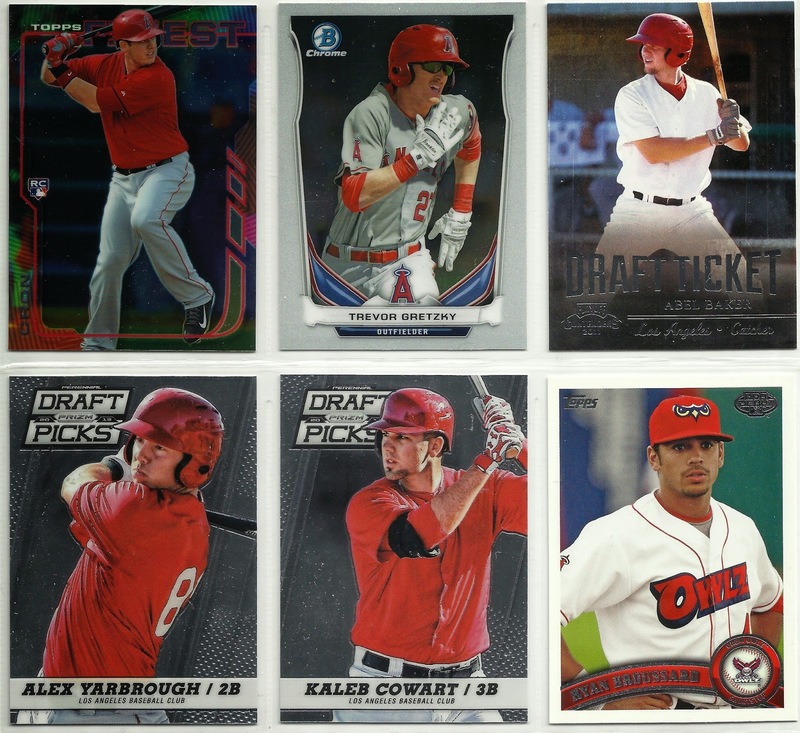 Here are the rookies that were in the two packs. 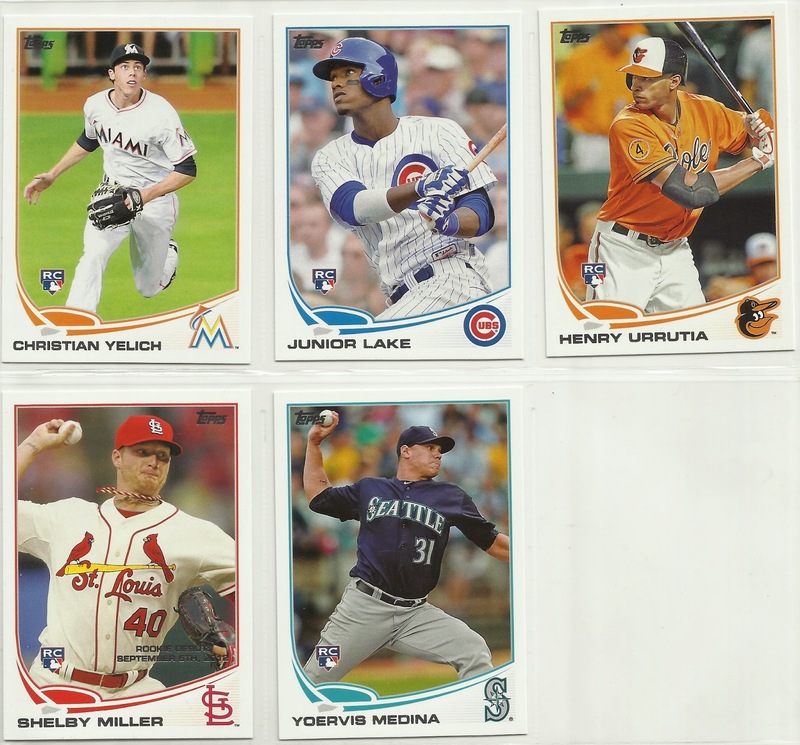 I like the Christian Yelich, he did me well on my fantasy team last season. was actually a double rack pack. 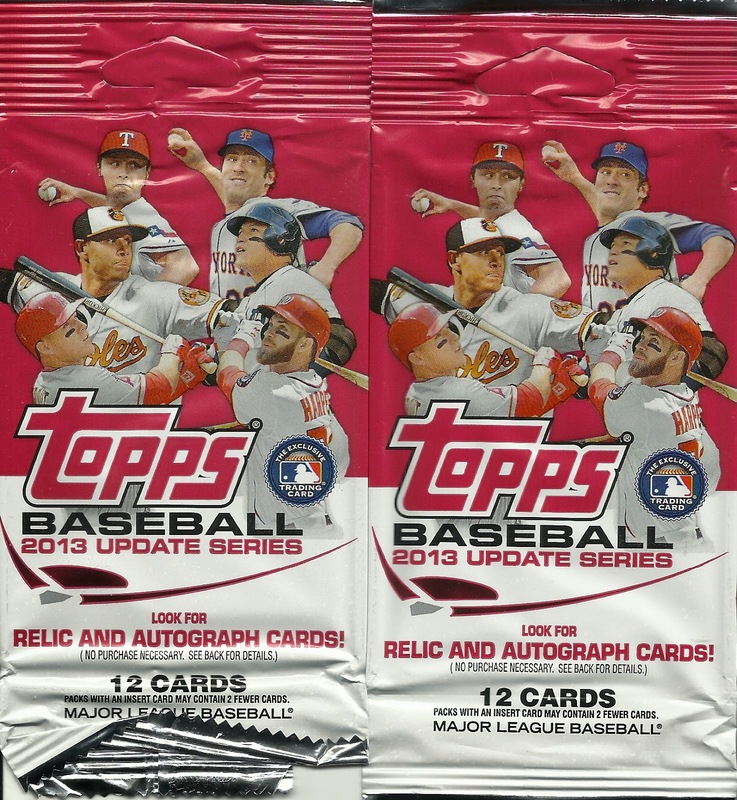 Not sure if all the Fairfield repacks have a rack pack but I'm sure glad mine did. 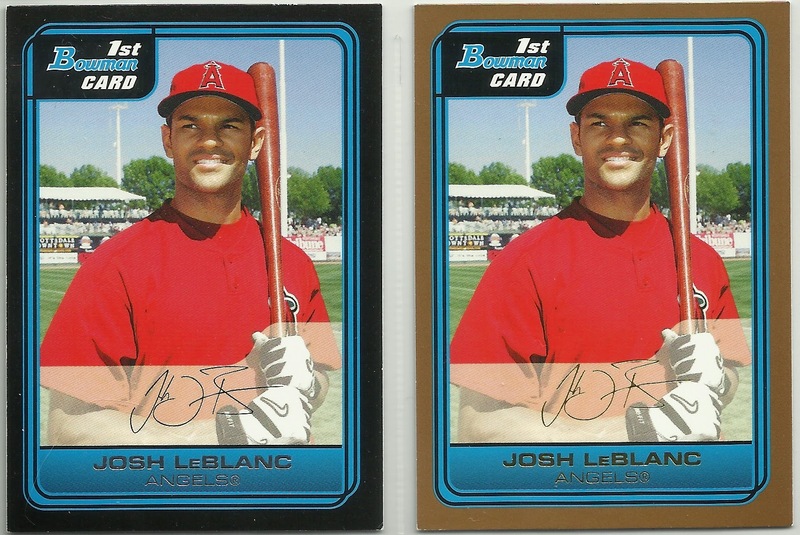 That's much more of a bonus than the 2002 Bowman Chris Smith card. 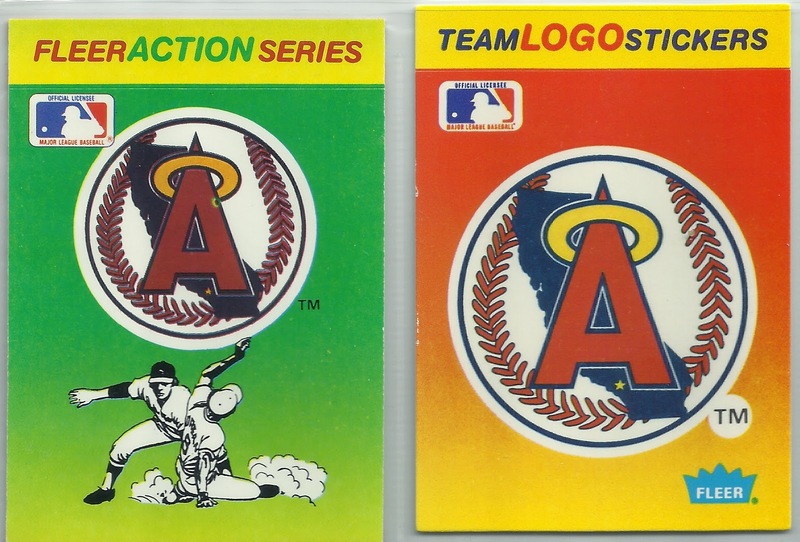 Awesome that it features an Angel on the wrapper. That doesn't happen too often. 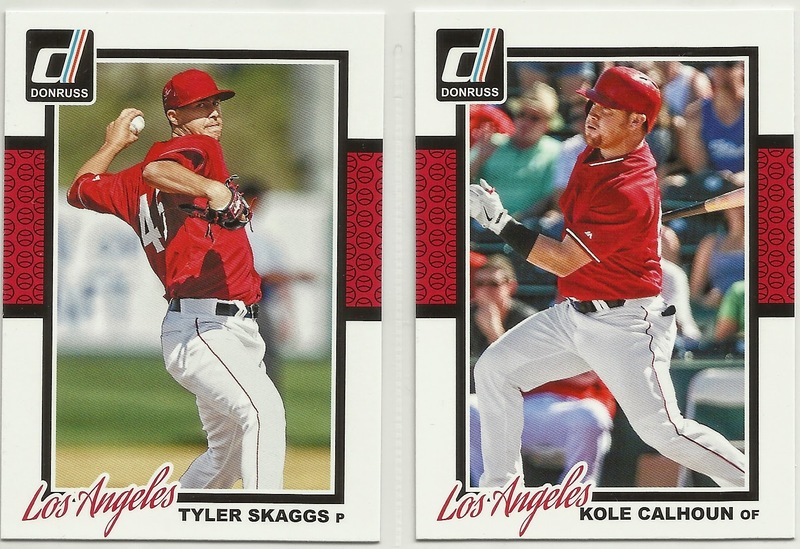 Again, nothing fancy in the inserts. 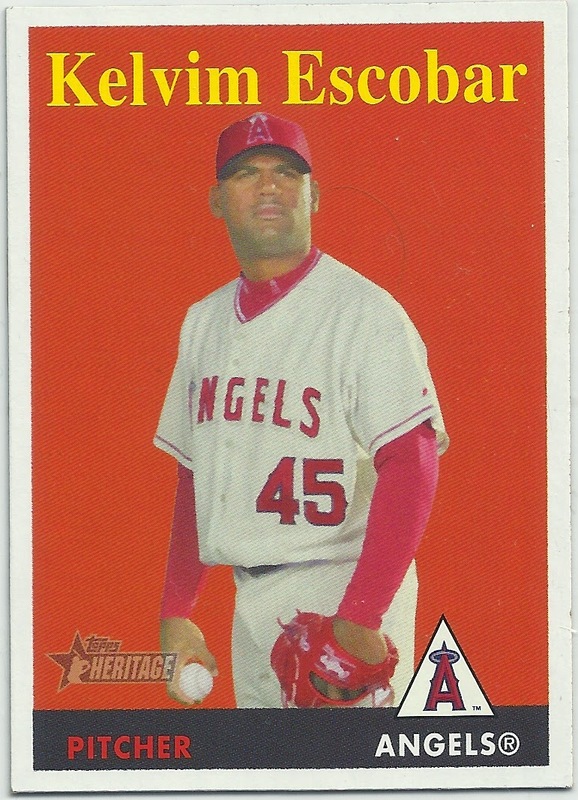 And I got an Angel rookie card. 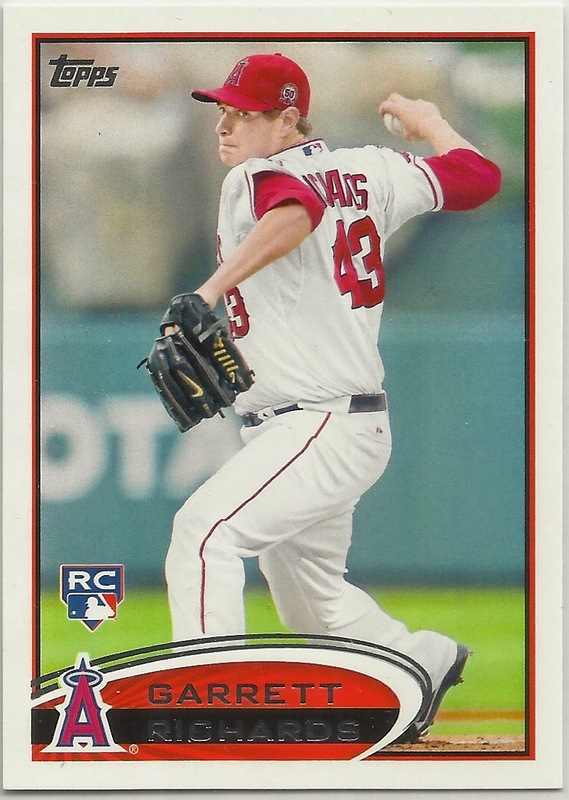 Garrett Richards, who would have taken the Angels all the way to a World Series win last year if he hadn't gotten hurt. Catching Up With Collecting has been mail crazy lately judging by all the trade posts I've seen in the last couple of weeks. That's great news for me because I get to add a post about being a recipient, and clear up some space by sending him stuff in return. 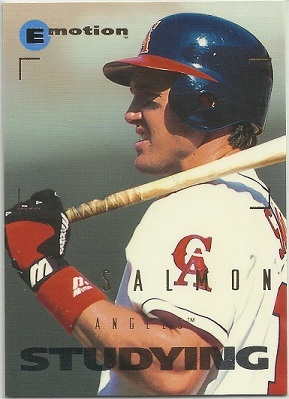 Obviously what was sent was a bunch of Angels cards but as I was going through them I noticed, or more like forced, a theme into the cards I went through. Similar to Noahs Ark a bunch of cards came in twos. 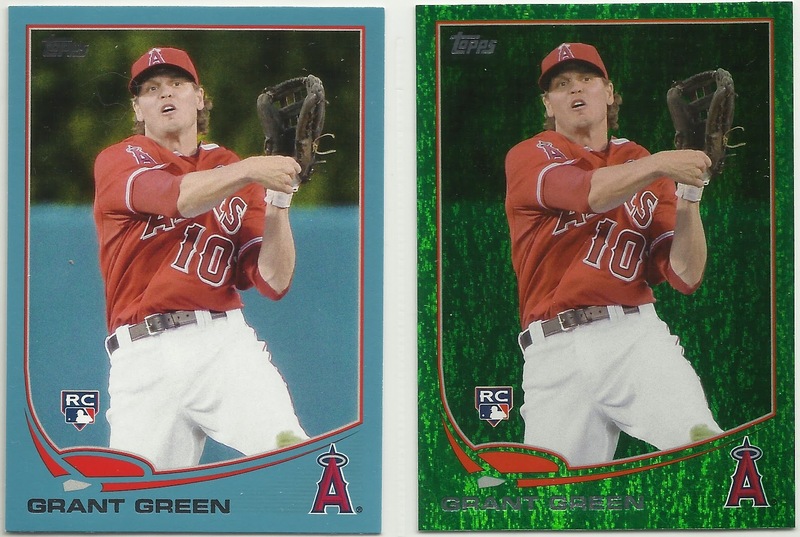 Walmart Blue and a Green Sparkle. 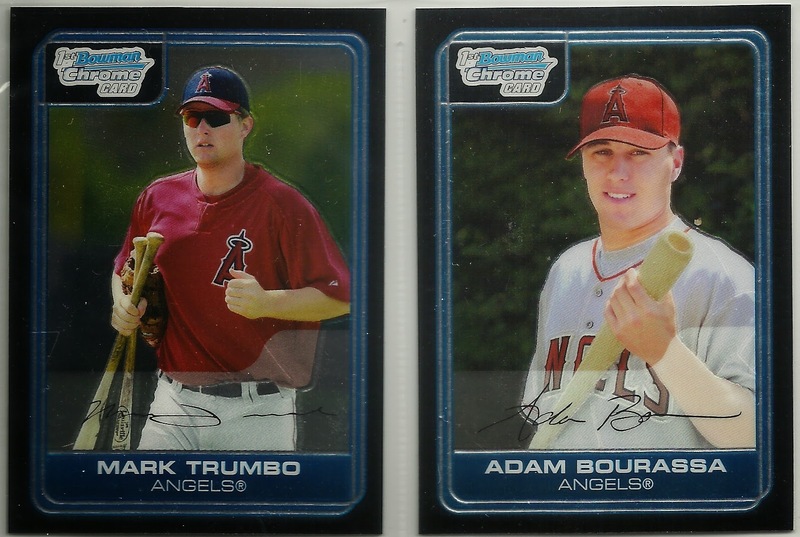 Mark Trumbo and an Adam Bourassa. Something to eat and a crazy man. I had never seen these before. Another of the many Score releases in the 80's. One of the better designs, in my opinion, with the striking red frame and yellow font. 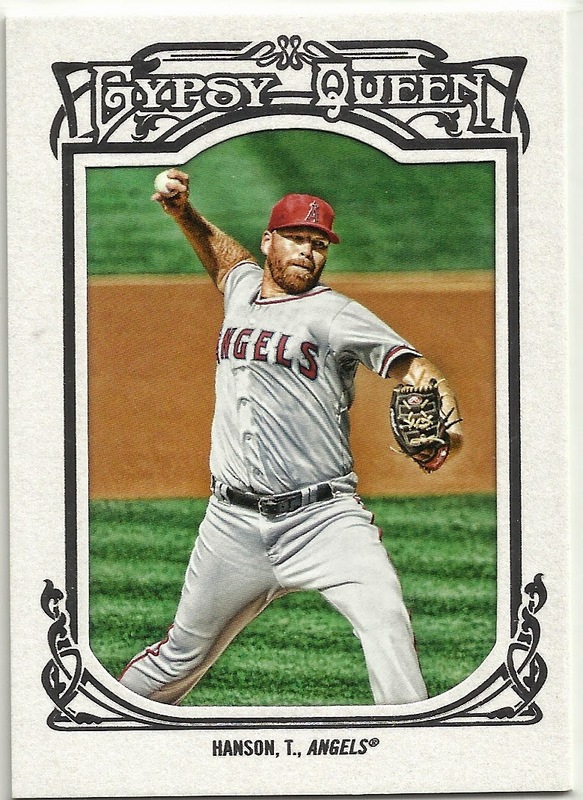 Tommy Hanson played for the Angels? Wow nice card, nice low-rate card. 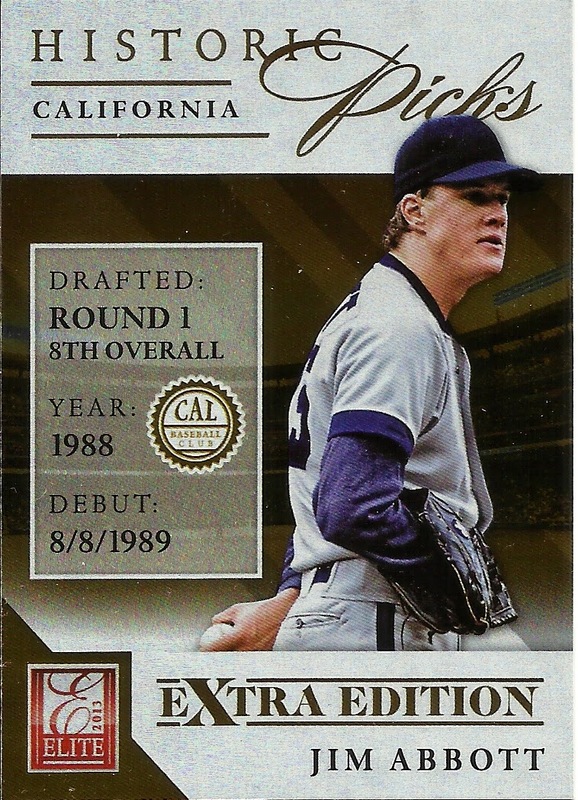 Nice low numbered, low-rate card. Ooh, haven't seen this one before. Kinda cool in how it looks steely. More to add to the sort-and-file stack. It's been growing quickly lately. 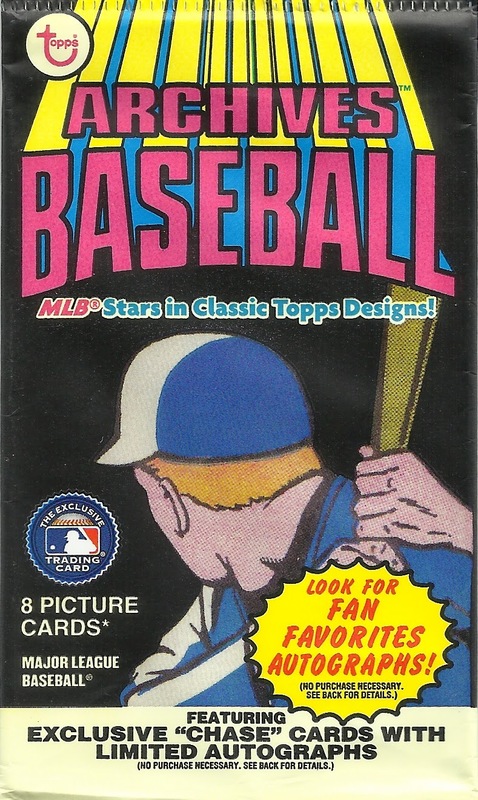 The Sandlot knocked out many of the 1979 and 1980 Topps cards I needed. In my haste to check them off and get them in the binder I neglected to count them up. But you can see from the photo that there were a TON that he sent. And they are all in really nice shape. Close to finishing these two sets off. Read in todays Fort Worth Star Telegram that long time Ranger Ambassador Joe Macko passed away, he was 86. He was the Rangers clubhouse manager for 29 years, but Joe also had a pretty successful minor league career as both a player and manager. 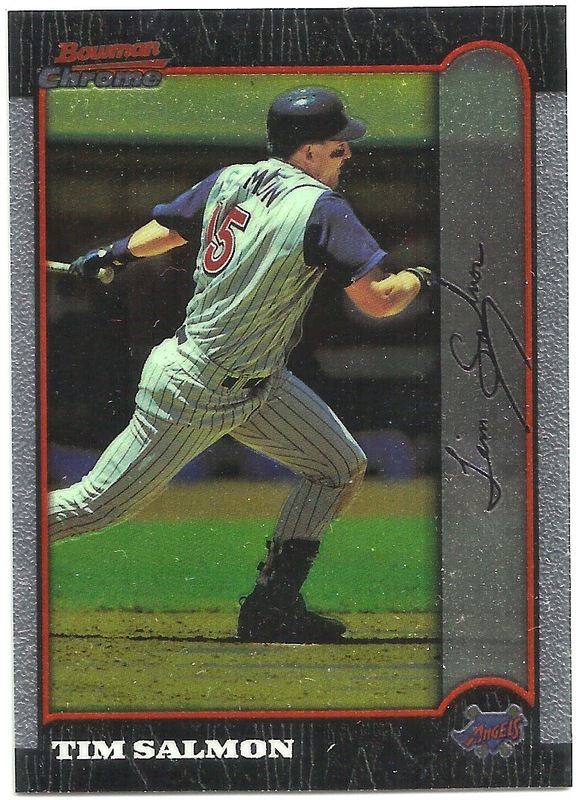 In 16 seasons he hit .272 with 306 home runs. He also went 11-7 over four years pitching with a 3.70 ERA. He once hit 11 home runs in Spring Training for the Indians but never got the call up. I'll remember Joe as an always happy face at just about every Rangers event, always willing to smile, share a story, or sign an autograph. 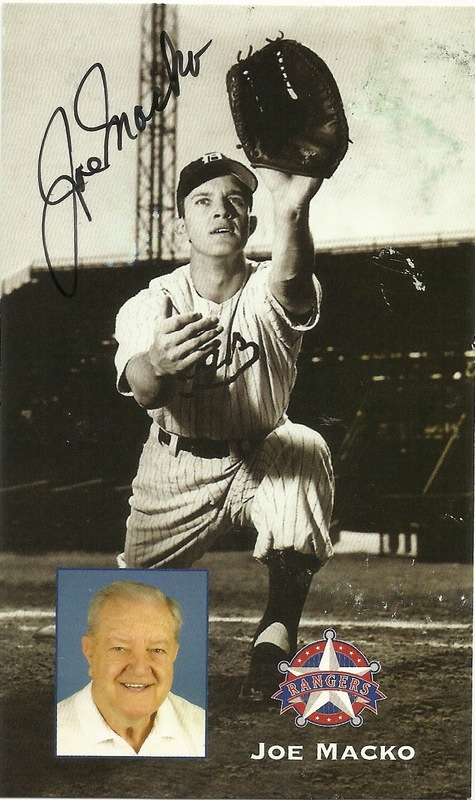 Joe signed this postcard for me at a Rangers event in 2004. No. 3 Of The Top Ten...DONE! Won this on Listia a while back, my number 3 want on my Top Ten. I would have been happy to just pick up the card, un-graded, but when this guy came up for bid, and a PSA 9 at that, I had to go for it. I was surprised when I won it for just 9,926 credits after only 4 bids. It didn't come from a smoke-free home, it was pretty yellowed. But after a thorough cleaning with a cotton ball dampened with isopropyl alcohol it looks great. Can't say it enough, there's some cool stuff to get on Listia. Here are a few more I picked out to display. 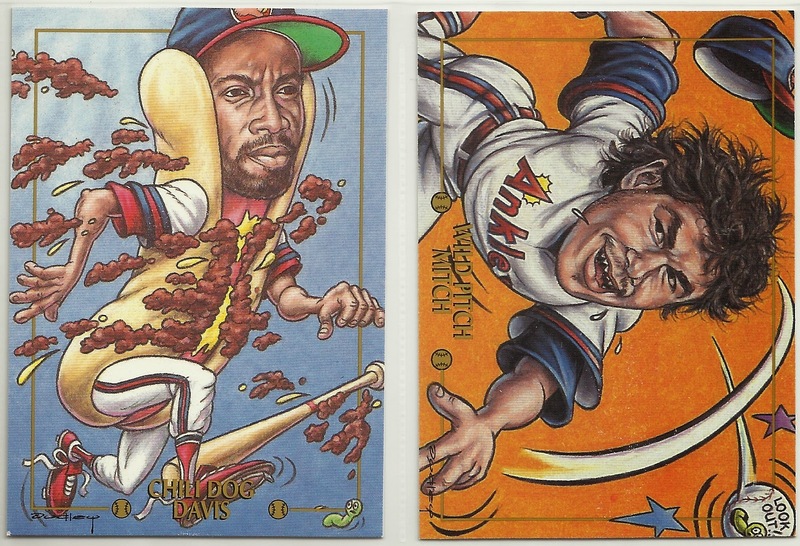 But Panini chose to show Abbott in an airbrushed Yankee or White Sox uniform. I like cards of the yungins. 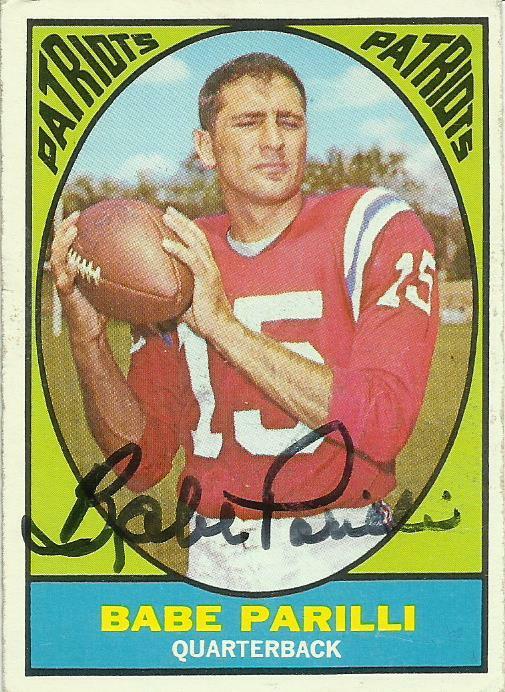 Every Spring I send out cards to the young guys invited to camp, hoping to get an autograph in return. I see three maybe four of these that will get sent out this spring. 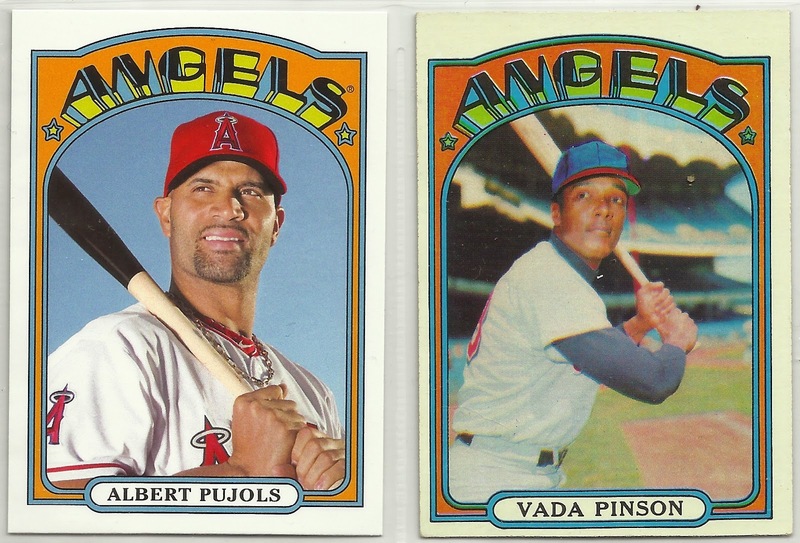 Topps did a good job replicating the 1972 design but what they forgot was the 3D look typical of the 1972 set, like that of Vada Pinson. 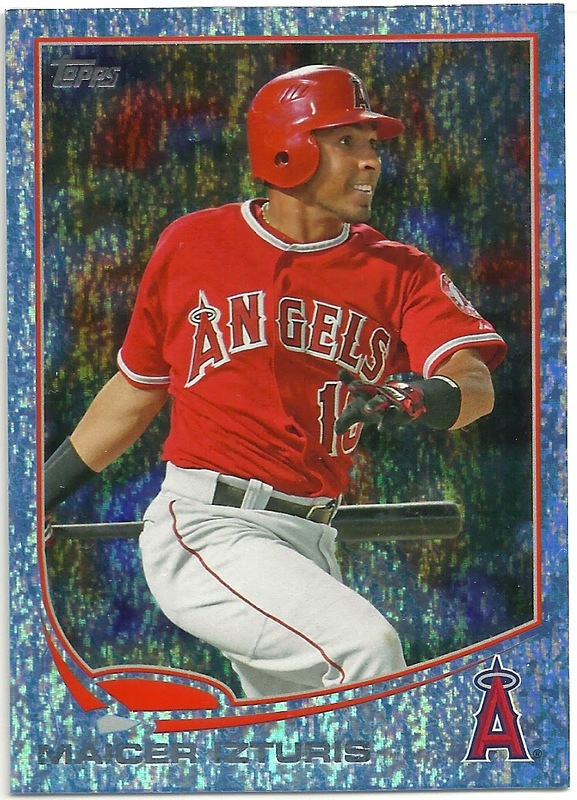 A pair of 3D glasses make Vada pop right out of the card. 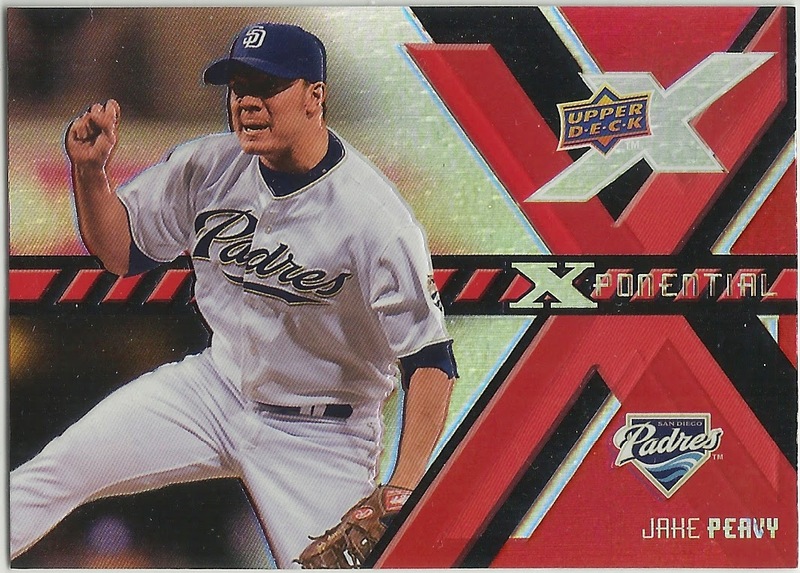 Happy to get this card since I recently lost out on a bidding war for another one on Listia. Happy also that I was able to keep all those credits I would have used on it that I have since used on other cool cards. Very happy to get this Zip. 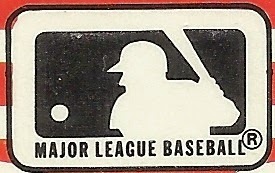 I think it's been pretty well documented that the player likeness used for the MLB logo shown above is Harmon Killebrew, even though in a 2009 interview the designer of the logo claimed it was not. Read it HERE. Regardless, what has not been established is who the pitcher was that threw the ball. Or, better yet, whose ball is that approaching (or leaving) Harmon Killebrews alleged likeness? 29 AB, 14 H, 6 HR, .483 BA, 1.138 SLG. So Jim Lonborg was the pitcher whose likeness the ball was designed. 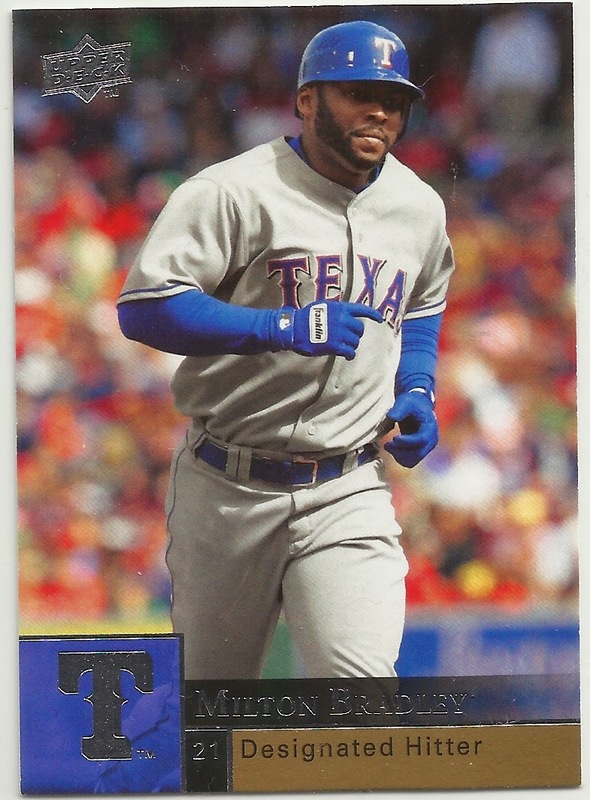 Found that sweet, rubbed off logo on this card. Going through some old files I found a candy bar wrapper that I forgot I had kept. I must have kept it because it featured the then Patriots quarterback Drew Bledsoe, a favorite of mine. This promotion was active in 1996. So there were three different quarterback bars: Bledsoe, Dan Marino, and John Elway. 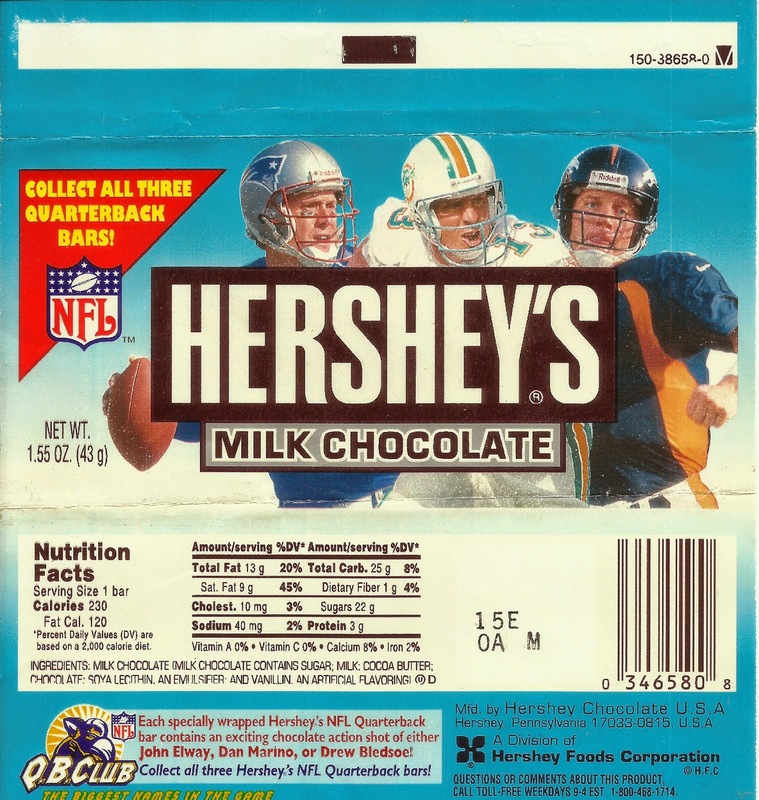 The chocolate bar was molded with an image of one of the three QBs. I do not recall which quarterback I got, but I'm sure that he tasted delicious. I don't recall Hersey's having similar promotions where they featured athletes on their bars. I think I remember movie promotions, maybe. Anyhow, the wrapper, to me, was collectible. Here is the wrapper unwrapped so you can see the nutritional value of a Hershey's chocolate bar. For a period in my life I switched over to preferring dark chocolate. Dark chocolate is more mature, I think. And better for you, more nutritional. Recently however I've gone back to milk chocolate, specifically Hershey's. Now that I'm 50 being mature is not something I desire as much. I keep a giant milk chocolate with almonds consistently in the fridge. So there were 3 different bars. Hershey is encouraging the consumer to "Collect" all three bars. But you wouldn't know what bar you had until you unwrapped it. So now you have an unwrapped chocolate bar. Being a "collector" I would then want to put it in a protector of some sort. Pretty sure there are not Chocolate Bar Top Loaders out there. I do have another wrapper (without the chocolate) if there are any other collectors interested. Todd Greene Rocks! Times FIVE!